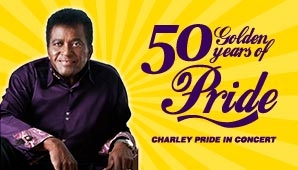 Charley Pride is one of the biggest selling country music artists of all time. He has sold an incredible 70 million albums, including 31 gold and 4 platinum albums – as well as one that achieved quadruple platinum status. On RCA Records Charley Pride is second in sales only to Elvis Presley. This incredible legacy is a powerful reminder that 'The Pride of Country Music' remains one of the great legends in popular music - and that he is still going strong.